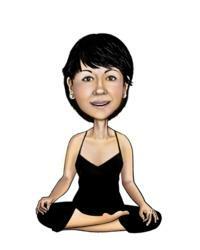 Author and self-taught yogi Laura Venecia Rodriguez (http://www.DoYogaAtHomeNow.com and http://www.laurasathomeyoga.com), who has been practicing gentle yoga for over 40 years, says, "during the holidays stress expands exponentially because of the lack of time and money to get 'it' all done and the pressures to produce perfect, idyllic experiences with family and friends. The extra shopping, cooking, cleaning, and entertaining that the holidays require can trigger anxiety, depression, sleep disturbances, and lethargy." Half-instructional, half-motivational, "Yoga at Home" includes easy yoga breathing techniques such as the alternate nostril breath and dreamlike, slow-motion poses like neck rolls and the backward bend that take only a few minutes and easily induce relaxation and calm. The book gives the reader step-by-step instructions for 20+ yoga poses, tips on how to keep yoga fun and avoid injuries, as well as creative techniques to gain maximum benefits from a yoga practice. Although yoga books abound, "Yoga at Home" is likely the only one written by a “real, regular person” who considers herself the consummate klutz. Written in a simple, easy-to-follow format, and laid-back style, "Yoga at Home" makes yoga accessible to the timid beginner or person who may have thought that yoga was beyond his or her reach. “Yoga is NOT just for the elite corps of supermodels, celebrities, athletes, or super-flexible instructors, whom many of us could never match in ability,” asserts Ms. Rodriguez. Real, regular people can learn and benefit from simple, gentle yoga. "Yoga at Home" proves it’s not necessary to do the complex, pretzel-like poses shown in magazines, or the super-intense forms of yoga often taught in yoga studios, to gain tremendous benefits from this 4,000-5,000 year-old practice.